High on a mountain top, overlooking snowcapped peaks to the west and the pretty town of Golden, Colorado to the east, is the quiet grave of the world’s first superstar. Not Elvis – he was not even born until 18 years after this superstar was laid to rest. No, this is the grave of Col. Buffalo Bill Cody. Today, Buffalo Bill is remembered as a historical figure, but from 1883 to 1913, he created the first show business world tour -- “Buffalo Bill’s Wild West.” There has never been anything else quite like it. You can get a glimpse of this superstar and his exciting life as an army scout, Pony Express rider, buffalo hunter and showman, at the Buffalo Bill Memorial Museum. Located on top of Lookout Mountain, just a short walk from his gravesite, the museum has many of his costumes, guns, hats and posters from the show, as well other artifacts from the many people who appeared in his shows, including gunfighter Wild Bill Hickock and Chief Sitting Bull, who wiped out Custer at the Little Big Horn. Kids (and adults) can try on western outfits for Facebook photos, and the view from the museum is the best in all of Denver. So is the drive to the museum, up the twisting Lariat Loop Trail. The world’s best cyclists have twice pedaled up this torturous climb in the USA Pro Challenge. Every day, dozens of bicyclists come up the mountain, while hang gliders float down. The Dinosaurs: We’re talking real Old West history here, but the Golden area was once a tropical swamp filled with dinosaurs, and the first T-Rex bones were found in Golden on top of South Table Mountain. The Triceratops Trail runs for 1.5 miles through Golden and you can see 100 million year old footprints of a Tyrannosaurus rex, Edmontosaurus, and Triceratops. Nearby at Dinosaur Ridge, you can see actual dinosaur bones still in rocks and examine hundreds of dinosaur footprints. A museum tells the story of the “dinosaur gold rush” that was unleased in 1877 when Arthur Lakes, a professor at the Colorado School of Mines in Golden, discovered the first dinosaur bones and thrilled the world, sending hundreds of scientists to the Golden area to look for more fossils. Golden will once again be the center of the rip-roaring Old West when it hosts the annual Buffalo Bill Days celebration, July 29-31, 2016. The three-day Western event dates back to the 1940&apos;s, when it began as a trail ride up Lookout Mountain to Buffalo Bill&apos;s grave. 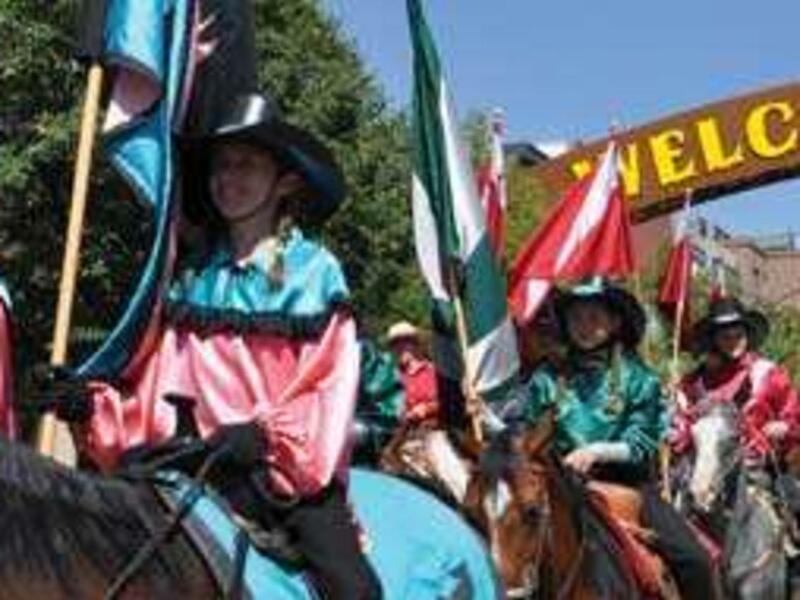 Today, it’s a Western parade, concerts and Golden’s largest annual event. This year&apos;s activities include Cody&apos;s Wild West, the "Best of the West" Parade, Muttin&apos; Bustin&apos;, live music, an orphan car and a classic car show, a golf tournament, food and merchandise vendors and much more. It all begins Thursday, July 28, 2016 with the golf tournament at Applewood Golf Course. The “Best of the West Parade” starts at 10 a.m. on Saturday, July 30 and winds through downtown Golden with 70 horses, floats, bands, collectable cars, and a variety of surprises. Immediately after the parade, “Cody’s Wild West” is a 90-minute extravaganza for the whole family with a Civil War cannon, military flag detail, live American eagle from HawkQuest, bagpipers and drum corps, flag-flying horsemen, and of course, the great showman himself, William Frederick “Buffalo Bill” Cody. There will be Colorado sharpshooters on fast horses, local legend Hazel Miller singing the national anthem, Mexican dancers, shooting exhibitions by Buffalo Bill and Annie Oakley, traditional songs and dances by Native Americans, roper-extraordinaire Craig Ingram and his wife Audrey performing amazing lasso tricks, the Westernaires doing amazing feats of horsemanship, and the 79th Highlanders bagpipe band with Celtic dancers. Cody’s Wild West will take place at 12:30 pm., Saturday July 30 following the conclusion of the “Best of the West” parade in Lions Park ballfields on 10th St.